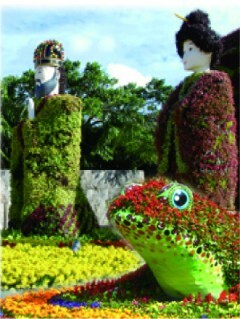 This is the season for many flower festivals on Okinawa. In Ocean Expo Park in Motobu flowers are planted to create figures shaped like a whale shark and manta. At Shuri Castle, there are Ryukyu Kingdom inspired dolls that are made with orchids, and another figure depicting a person in a bingata design costume performing a classic Ryukyu dance. Many other places on the island have similar displays. This is the right time to enjoy Okinawa decorated with colorful flowers.